It is my belief that the acquaintance of these two men led William the Conqueror to commission the Bayeux Tapestry sometime after William fitz Rivallon became abbot of Saint-Florent in 1070.1 Duke William’s participation in King Henri I’s campaign against count Geoffrey Martel of Anjou had brought him to Mouliherne, a short distance from Saumur (ca. 25 kilometers) in 1049.2 If he had not learned about the abbey of Saint-Florent and its textile workshop at that time he would have become aware of it later through Abbot William. The nature of the relationship between the two men opens the way for speculation (and it is only speculation) about what persuaded them to agree about the making of a tapestry. 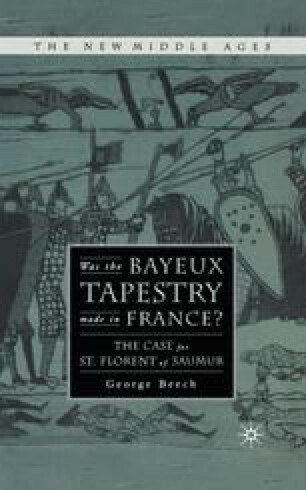 The Saint-Florent documents are no more forthcoming about what might have happened than were those of Saint-Augustine’s in Canterbury or Bayeux for the hypothesis that the tapestry was produced in those places. Viewing the Saint-Florent collection could have inspired the English king with the idea of celebrating his recent conquest in a tapestry with an extended series of scenes, particularly if he saw something of that kind already at that abbey. Among its possessions in Abbot Robert’s day some 75 years earlier were “…others of great length and suitable width…with white borders decorated with red animals and birds” (p. 11, note 3). A brief description of the Bayeux Tapestry might not have differed greatly from this. Or Abbot William could have suggested as much to the king.